A backup computer outage on the International Space Station is forcing NASA to discuss plans for a possible spacewalk repair by astronauts in orbit, a move that could delay the planned Monday launch of a commercial SpaceX cargo ship to the orbiting lab. NASA officials decided Saturday (April 12) to avoid a final decision on whether to delay the unmanned SpaceX Dragon launch as station engineers weigh options to fix the backup computer, which stopped responding to commands Friday and is part of the station's robotics system. SpaceX currently aims to launch the Dragon capsule from Florida's Cape Canaveral Air Force Station at 4:58 p.m. EDT (2058 GMT) on Monday. Station astronauts plan to capture the craft with a robotic arm on Wednesday. A SpaceX Dragon commercial cargo craft is seen in the the grips of the Canadarm2 before being released May 31, 2012. The space station's robotic arm is used to capture and release SpaceX Dragon cargo ships during their resupply missions. Because the station's robotic arm is vital to capturing the Dragon spacecraft and attaching it to the space station, NASA is studying the issue extremely closely. The space agency rescheduled two Sunday morning press conferences on the upcoming SpaceX mission to later Sunday afternoon while engineers discuss their options. Astronauts on the space station would have to perform a spacewalk to fix or replace the computer. The MDM computer repair is one of 12 scenarios NASA astronauts regularly train for before flying to the space station. The problem cropped up late Friday, when a backup computer known as a Multiplexer-Demultiplexer, or MDM for short, stopped responding to commands. 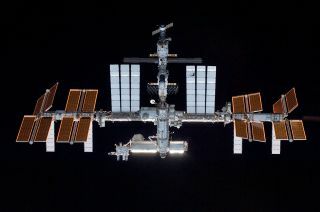 The device is located on the station's exterior and serves as a backup controller for the Mobile Transporter, a railcar that moves the Canadarm2 robotic arm along the space station's backbone-like main truss. The primary computer that controls the station's Mobile Transporter is working perfectly, NASA officials wrote in the status update. But the backup computer, called EXT-2, failed a routine health check on Friday. The failed MDM backup computer is one of more than a dozen on the station's exterior "that route computer commands to various systems on the outpost," according to the NASA statement. SpaceX's current Dragon mission to the space station has been delayed since March due to an unrelated damage to ground radar equipment used during launches from the Cape Canaveral Air Force Station. This mission, called Commercial Resupply Services 3, is SpaceX's third resupply mission for NASA since 2012 under a $1.6 billion contract. If SpaceX does not launch its Dragon mission on Monday, the mission could potentially target a backup launch day of Friday, April 18. But that will depend on any NASA plans for a spacewalk repair. SpaceX plans to fly at least 12 Dragon cargo missions to the space station for NASA under its contract. Another company, the Dulles, Va.-based Orbital Sciences Corp., has a $1.9 billion deal with NASA to provide eight resupply flights using its own Antares rockets and unmanned Cygnus spacecraft.